One of Athleta’s first stores opened on Fillmore. Now there are 41. SIGNALING IT WILL be harder for chain stores to open on Fillmore Street in the future, the city’s Board of Appeals on May 15 revoked the building permit secured by German-based clothing company Oska for the space at 2130 Fillmore, where it had intended to open a new boutique. Now that Oska has been adjudged a chain store subject to the city’s formula retail ordinance, it cannot open without going through a conditional use hearing to determine whether it is appropriate in a neighborhood already home to many chain stores and women’s clothing shops. The formula retail ordinance requires conditional use approval before companies with 11 or more retail establishments in the U.S. can open in many San Francisco neighborhoods, including upper Fillmore Street. The board found that Oska has nine stores currently operating in the U.S., as well as leases for two additional stores — in Healdsburg and in Evanston, Illinois — bringing its total to 11 retail establishments within the meaning of the law. Oska’s west coast managing partner Monique Ramos was issued a permit in early March to refurbish the space occupied for two decades by Jet Mail. But Miyo Ota, owner of the women’s boutique Mio, located a block away, filed an appeal. Ota and others who spoke in support of her appeal at the May 15 hearing accused some corporate owners of strategically opening on Fillmore Street while still under the limit of 11 stores, even as they are busy planning further expansion. Examples include the women’s athletic apparel shop Athleta, owned by the Gap, which opened in January 2011 at 2226 Fillmore and now boasts 41 stores nationwide with more coming. Drybar, the blow-dry salon that opened at 1908 Fillmore in June 2011, now has 28 stores in operation with another in the works in Encino. 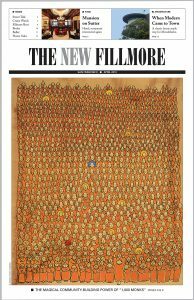 Nearly half of the stores on Fillmore would now be defined as formula retail. 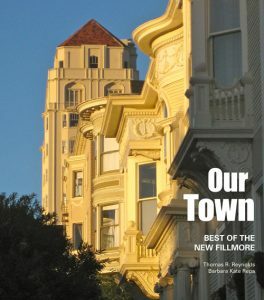 Some, such as Starbuck’s, Eileen Fisher and Noah’s Bagels, established a presence on the street before the ordinance was extended to Fillmore by the voters in 2008. 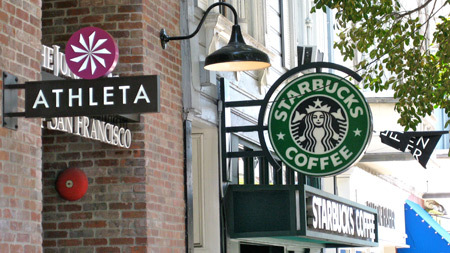 Ironically, the chain store ordinance had the effect of spurring more corporate labels to rush to set up shop here before they “get to 11.” Of the two dozen new stores that opened on Fillmore Street in recent months, none were considered formula retail when they opened, yet nearly all now surpass the limit of 11. Ota and those skeptical of more chains on the street argued that the city should consider whether a potential newcomer was a chain-based business planning more than 11 stores. Ota also encouraged city officials to count online stores as “retail sales establishments” under the ordinance. “Open your minds and realize that the Internet should be counted as part of the ‘retail establishment’ under the law,” Ota urged. But Oska’s attorney, John Kevlin, argued that counting websites as retail establishments “would be a significant departure from past practices” in interpreting the formula retail law. Some also testified they are concerned about retailers with stores out of the country — Oska, for example, has nearly 50 freestanding stores outside the U.S. — which gives them an economic advantage over small and family-owned businesses. • the mix of citywide-serving and neighborhood-serving retail uses. Oska’s Monique Ramos would not comment about whether Oska plans to pursue conditional use authorization to open a store on Fillmore.